A few weeks ago my friend came over armed with a bunch of her 4 year old daughter's jeans and leggings...and with a perplexing mystery. The kiddo had somehow managed to wear holes at the knees of all these pants. (Climbing fences? Crawling in the mud? That mystery still remains unsolved.) So I cut them off (the leggings, not the knees) below the holes and hemmed the edges so that they could then be used in their new avatar of shorts. Which left me with some legging cut-offs that promptly went in my 'use-it-for-something-later' stash. 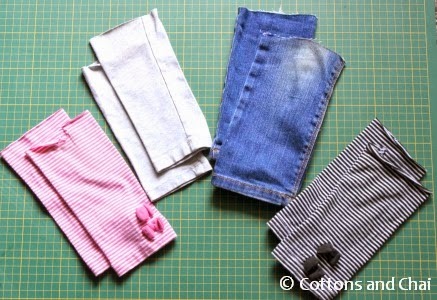 That's how I've lined up 5 upcycled legging cut-off projects in increasing order of complexity (ranging from 'pff, child's play to meh, that's it?!'). What you need: Bathroom accessories you want to cover, scissors, tape measure and legging cut-offs. Measure the length of dispenser you want to cover and cut legging to that length + 1/2". Then just pull the legging over the dispenser, leaving the extra 1/2" on top. Next fold the extra bit inward to give a clean upper edge. Since this is a knit legging, it stays up just fine! What you need: Used tin/can that is washed and dried, construction paper, piece of ribbon/ ric rac, tape measure/ ruler, marker, scissors, glue. Step 1. Measure the height and circumference of the tin. Cut a rectangle out of construction paper with length = circumference + 1" and width = height + 1". 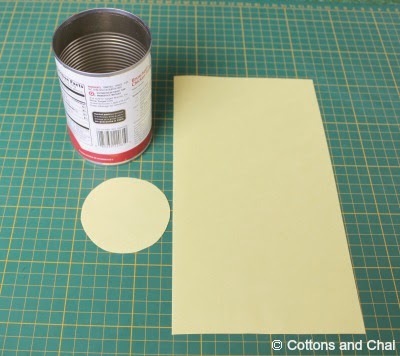 Also draw an outline of the bottom circular edge of the tin on the paper and cut it out. Next cut the legging length = height of tin + 1/2". Keep this aside for now. Step 2. Glue the circle to the inner bottom of the tin. Roll the rectangle such that shorter edges overlap and place it into the tin. Make sure the sides of the paper all touch the tin and mark the edge where the sides overlap. Step 3. 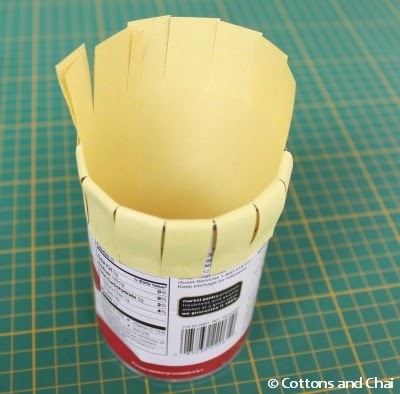 Apply glue onto the overlapped paper with marked edge for reference to make a tube that will exactly fit inside the tin. Then apply glue to the inner sides of the tin and fix the tube in place. You will have about an inch of paper sticking out of the tin. Step 4. Make cuts in the paper that's sticking out, apply glue onto each notch and fold it over on the outer edge of the tin. Step 5. Then apply glue to the outer sides of the tin, pull the legging cut-off over it and stick in place. 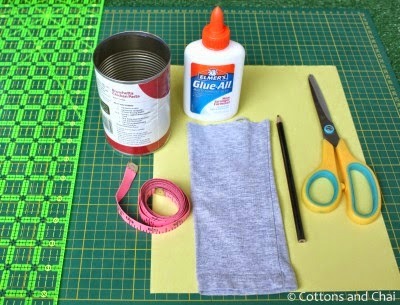 Glue the top 1/2" border to the inside of the tin and cover the edge with ribbon or ric rac. Step 6. Lastly, just add any sort of decoration you like. I found this bit of fabric that was the perfect fit for my tin and glued it on. 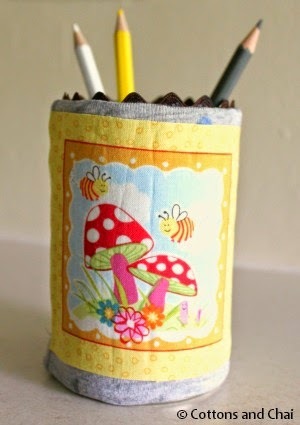 Here's your adorable upcycled pen stand! 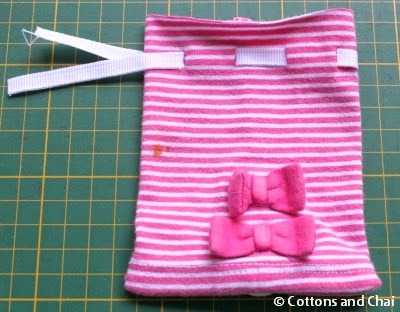 Need a little bag for any kind of tiny knick knacks? Step 1. Turn the legging tube inside out and sew the bottom opening closed with either 1/4" or 1/2" seam allowance. Turn it right side out. Step 2. About 1 inch from the top, mark tiny vertical lines about 3/4" apart on the front and back of the tube. Step 4. Weave in the first bit of ribbon starting from the leftmost front cut all the way around the tube. Bring other end of the ribbon out of the leftmost cut at the back. Knot the two ends. Step 5. Weave in the other ribbon similar to Step 4, but in the opposite direction. Pull on the two knotted ends and it's a cinch! 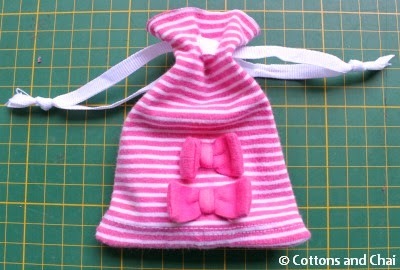 The cute little drawstring bag is done! Step 1. 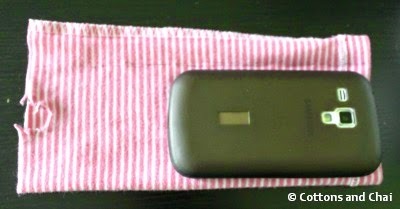 Turn the legging tube inside out and place your mobile phone over it lined up with one side to mark a line 1/4" from the phone on the long edge. This is to determine how wide the cozy needs to be. Step 2. 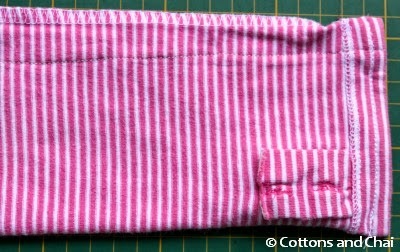 Sew along the marked line to make the cozy as wide as the phone. Then sew along the bottom short edge to close the legging tube. Step 3. Fold the top edge of the legging tube about 1/2" over and sew to make a casing for the elastic. Leave a 1" gap for sliding the elastic through. 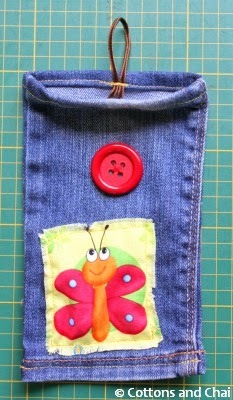 Attach a safety pin to one end of the elastic and then slide through the casing. Step 4. Sew the two ends of elastic closed. Next, sew the gap in the casing closed. 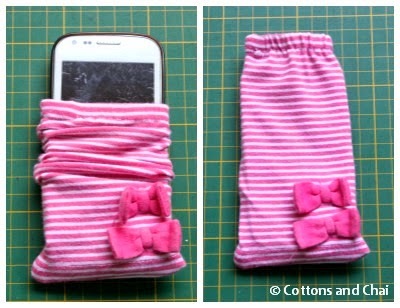 Turn the legging right side out and your cell phone is all set to get cozy! 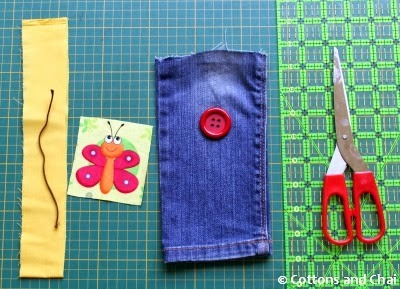 What you need: Denim (or cotton) cut-off, button, piece of chord, either 20" long crossgrain ribbon or piece of fabric 20" * 2.5", other items to decorate bag (optional). Step 1. If you've opted to embellish the front of the bag, do it now. 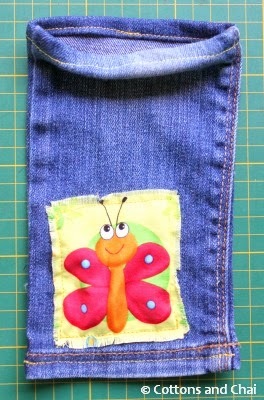 I went through my stash of fabric collected especially for fussy cutting and chose the googly-eyed little butterfly. I sewed that on the front and distressed the edges a bit. 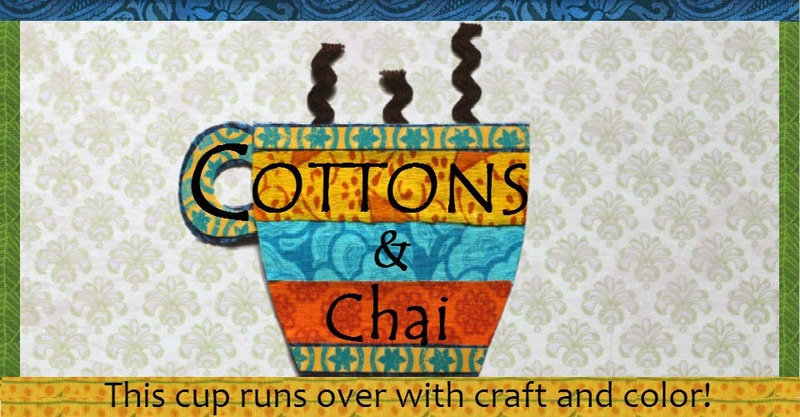 You can make a design with buttons, or use fabric paints, whatever catches your fancy! Step 2. 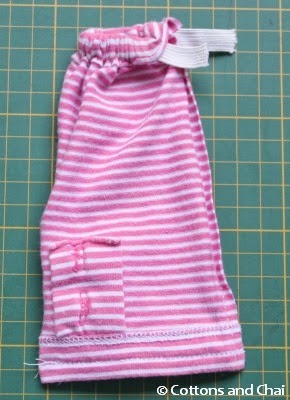 Fold the top edges over twice and hem or sew around it. Step 3. 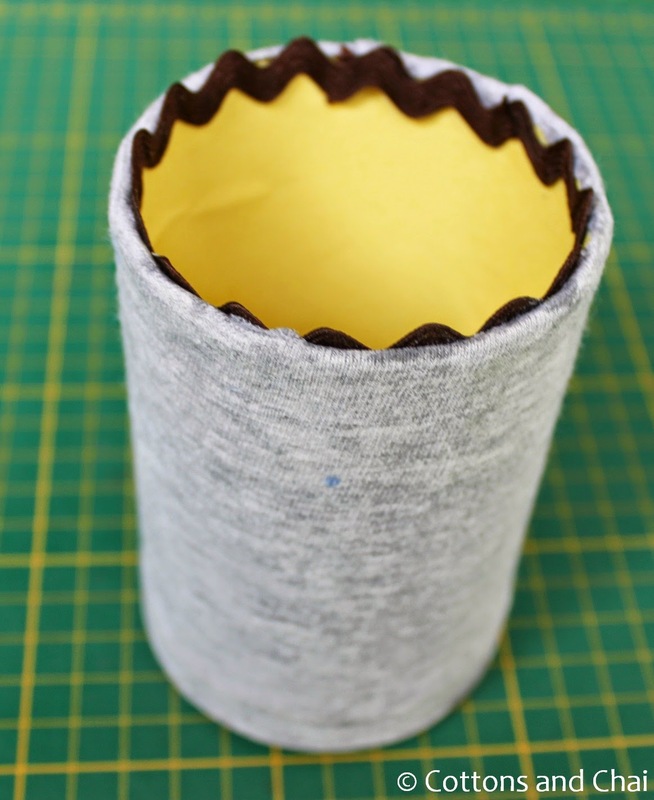 Fold the tube over from the top 1 inch and mark the spot where your button should go. Sew the button. Then on the back of the tube, mark the spot where the loop of chord should go. Cut the length of chord as per the diameter of the button and sew the chord onto the top back edge. Step 4. 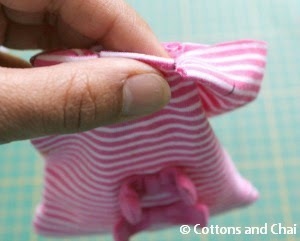 Fold the top and close the bag by looping over the button. This will help determine the points on either side of the bag where the sling handle ends should go. If you're using a fabric handle instead of ribbon, fold the fabric in half lengthwise and finger press or iron the crease. Open it up and fold again lengthwise from either side to the crease. Fold over again so that raw edges are now towards the inside. 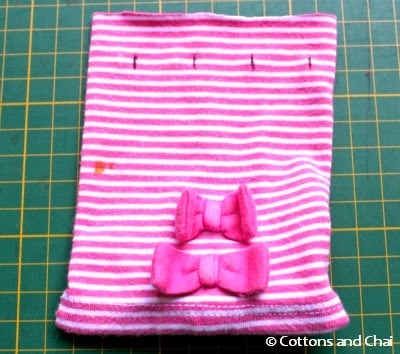 Sew along the length to make the handle. Stitch the ends of the handle/ ribbon to the points marked on either side of the bag. And that's the sling bag ready for it's day out! Whew! We're done and now it's time for me to leg it! pretty,pretty things. 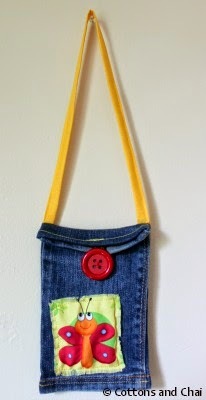 Can you please post a tutorial on how to make bags( thailis for mundane shopping) from old trousers and denims. It is a lost art now as the tailors charge INR 50 or more and ugly nylon bags are available for INR 15 that seem to last for ever. Some people still use them but more often they make their own. Thanking you in anticipation. But you know what, 50 rupees or even 100 seems very reasonable and fair to me for a tailor to do it!